Caption: L-R: Assembly Education Chair Cathy Nolan; Assemblymember Christine Pellegrino; President Andrew Pallotta; Executive Vice President Jolene T. DiBrango; First Vice President J. Philippe Abraham. Photo by El-Wise Noisette. 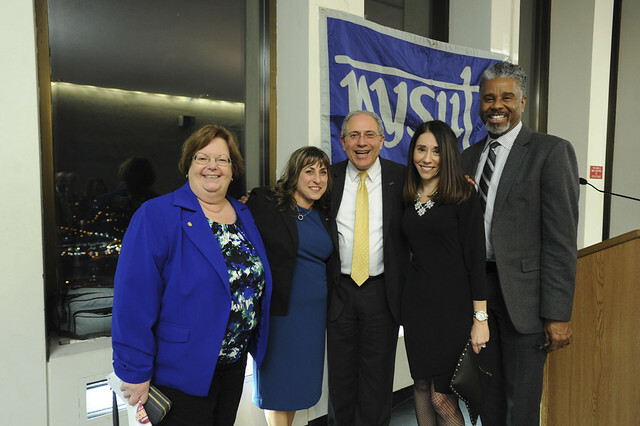 The NYSUT president welcomed the union’s leaders, friends and champions to its annual legislative reception on a cold, clear night in Albany. Before introducing legislative leaders, Pallotta outlined some of the union’s priorities. Noting that the executive budget’s proposed school aid increase of $769 million is just a starting point, Pallotta said that number needs to double simply to maintain current programs and services. He said increasing Foundation Aid, boosting districts that need it the most, is particularly important. On the need to finally fix evaluations for educators, he said, “APPR — those beautiful four letters — we would love to see them go away this year!” He called for local control and no state mandates. TAKE ACTION! Visit mac.nysut.org to contact your state representatives. TWITTER MOMENTS: Your tweets and photos. Pallotta also pitched increased higher education funding to support full-time faculty and restoration of the state subsidy for SUNY hospitals, which would be eliminated in the governor’s proposed spending plan. To pay for all this, he urged lawmakers to pass a progressive tax plan for the state’s highest earners and corporations, which would raise billions of dollars in new revenue annually to support public education, health care and infrastructure. Senate Democratic Leader Andrea Stewart-Cousins, a former educator, said constituents often ask her if this year’s budget deficit will have a negative impact on education in New York. State Comptroller Tom DiNapoli said the challenge of the pending Janus v. AFSCME case, to be argued in the U.S. Supreme Court Feb. 26, requires continued solidarity and organizing among union members to ensure they remember the value of belonging and paying their share. “Those dues enable NYSUT to do the great advocacy and the great work you do each and every day,” he said. Assembly Education Chair Cathy Nolan, D–Queens, brought greetings from Assembly Speaker Carl Heastie and expressed pride in having recent NYSUT members among their majority, including Christine Pellegrino from Long Island and Monica Wallace from the Buffalo area.